Supposedly, the White House is about to promise a balanced budget by 2034. I’ve been down that road many times in my 45 years of monitoring federal budgets, and it never happens. Making this promise even more ridiculous is that it is based on a projected GDP growth of 3% for the next 15 years. Not going to happen. The business cycle (recession follows boom, boom follows recession) has not been repealed. Over the next 15 years, we could see two recessions. 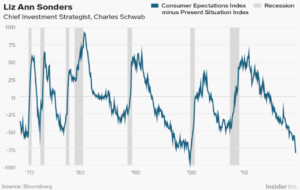 The vertical bars in the graph below show seven recessions since 1970. The current boom, which followed the Great Recession of 2008–2009, is now 116 months old. The tech boom of the 1990s, the longest, lasted 119 months, and up until the current, the second longest was Lyndon Johnson’s Vietnam War “guns and butter” expansion of the 1960s; it rolled into recession after 105 months. Making matters worse, the world economy is showing signs of weakness. Only last week, the European Central Bank reverted to stimulative policies, and declining exports out of East Asia indicate decreased demand from that area of the world’s economy. In that the average boom lasts only 63 months, this recovery is in its final stages. It has been so lengthy because of the $4 trillion printed by the Fed 2009-2015. Very little of the money printed coming out of the Great Recession has been withdrawn, despite the Fed’s promises to do so. Now, we’re looking at another round of easy money. The 2009-2015 printing propelled gold from $900 to $1900 and silver from $12 to $50. For the Fed to employ loose monetary polices at this stage of the business cycle shows just how reckless a bunch of people with PhDs can be. Further, the Trump budget proposes to add $4.2 trillion to the public debt for the fiscal years 2020-2023, which will be covered by money printed out of thin air. It was only 1993 that the national debt totaled $4.2 trillion. All of this – plus many other danger signs — is being recognized by the buyers who are keeping gold at the $1300 level while stocks are just short of new highs. When the Fed cuts it fed funds rate or worse economic data are posted that will cause investors to believe that the Fed cut, the metals will move higher.